“Ku Klux Klan Rally ,” Histories of the National Mall, accessed April 22, 2019, http://mallhistory.org/items/show/175. 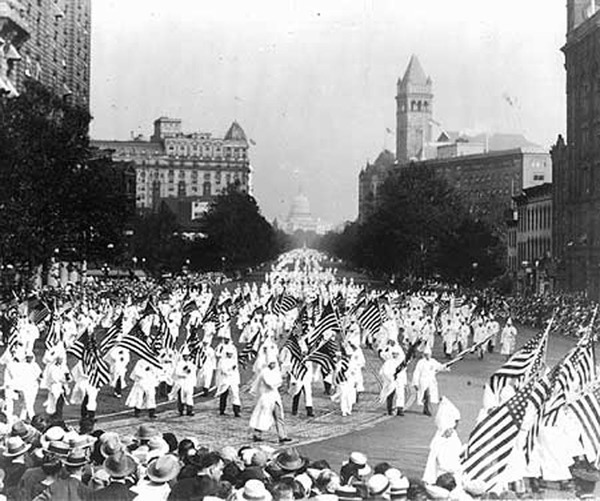 In 1925 the Ku Klux Klan (KKK) marched down Pennsylvania Avenue in Washington, DC. The organized event brought 25,000 members in full regalia to the city. Demonstrating at the height of their power, the KKK was a national fraternal organization founded on the premise of white supremacy. The KKK attacked the social and political rights of African Americans, immigrants, Catholics, and Jews. First founded in 1865, the power of the Klan peaked during the 1920s when urbanization, industrialization, and immigration frightened many Americans.